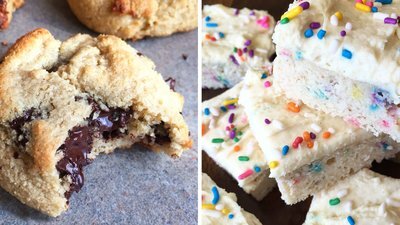 3 Must-Try Healthy And Sweet Protein Treats! Looking for a way to curb your sweet tooth? Whip up these delicious, protein-packed treats for all of the taste at a minimal calorie cost. We all need a sweet treat now and then, but you don't have to compromise on nutrition when you can bake a healthier version that tastes as good as the real thing! These protein-packed treats will not only satisfy your cravings and delight your taste buds, they'll also tide you (and your hungry muscles) over to your next meal! If you ask me, peanut butter and jelly is far too dreamy a combination to be confined to childhood lunchboxes. It's time to indulge in a healthier version packaged in delicious doughnut form. The flavor of these protein doughnuts is spot-on and will bring some serious nostalgia into your life. The texture is just, well, wow! Seriously, these macro-friendly donuts will blow your mind—without blowing your daily calories. After countless failed tries, I finally made chocolate chip protein cookies that aren't "weird." In fact, they're epic! These have everything you love about classic chocolate chip cookies: the drool-worthy flavors of butter, brown sugar, and vanilla; the melty chocolate chips; the soft and chewy middle; and the crisp golden edges. The best part? These cookies have an equal protein-to-carb ratio, and are lower in fat than your typical cookies. Each gooey morsel is only 75 calories! It's somebody's birthday somewhere, and that's more than enough reason to dig into these festive brownies! I've made blondies similar to these before, but this recipe takes the cake (pun intended). These blondies have a dense, soft crumb cake and thick, creamy frosting—oh, and they taste just like real birthday cake packed full of sugar, vanilla, and sprinkles! It's actually hard to believe they're low in fat, carbs, and sugar and packed with protein. Careful, these won't last long!